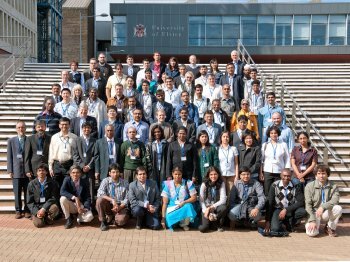 Representatives from UK universities and seven Research Institutes in India involved in research with the India UK Advanced Technology Centre (IU-ATC) in Next Generation Networks Systems and Services who attended a technical workshop hosted by the University of Ulster, Coleraine campus. Ulster is the lead UK partner in the £9.2 million collaborative research project. University of Ulster academics are responding to the growing global demand for affordable and efficient broadband by researching new technologies to meet the needs of the emerging digital economy in the UK and India. Such solutions will also apply to countries such as Brazil, China and the Middle East. Professor Gerard Parr, Chair of Telecommunications Engineering in the Faculty of Computing and Engineering at Ulster in Northern Ireland, is the lead academic investigator of a high-profile team of UK and Indian scientists and industrial engineers involved in a £9.2 million research initiative aimed at ensuring that both countries reap the full benefits of the digital age. Professor Ashok Jhunjhunwala of the Indian Institute of Technology, Madras is the Indian lead academic partner. The overall objective of the collaborative project, which is supported by both the UK and Indian governments, is to focus on research, innovation and wealth creation opportunities offered by new and emerging digital communications technologies. Now in the second year of a five-year programme, Professor Parr said the collaborative research would have many positive benefits. “We are working to develop Next Generation Telecommunications Networks and ICT systems and services, along with work on wireless sensor networks and underlying protocols. "This could have many practical applications such as improving the security of critical national telecommunications infrastructures, provision of supply-chain, agri-health services rural areas and early warning systems for landslide detection or floods in remote locations. Ninety researchers involved with IU-ATC, as well as senior representatives from the project’s industrial partners including BT Research Labs, Wipro Technlogies, and InfoSys Technologies attended a technical workshop hosted by Ulster’s Coleraine campus last month. The team included senior research Professors and Postdocs from UK and India and a number of PhD students who are working on areas related to the IU-ATC. The Coleraine workshop followed a series of technical meetings between partners in Bangalore, Madras, and BT Research Labs in Martlesham. Professor Parr said he was delighted to welcome the international research partners to Coleraine. “Seeing the significant number of partners who made the trip to Coleraine to attend our project meeting made the initiative very real and it was indeed a privilege to welcome all the partners and to observe how far we have come since the project was first conceived. "The Coleraine meeting gave us an opportunity to work through the key thematic work plans put in place to address a number of interconnected challenges, including wireless applications for rural India, energy-aware systems for core–access networks and data centres, quality of service frameworks for converged services, pervasive sensors for environmental monitoring, security and resilience for critical infrastructure protection, provision of communications in emergency response situations and the creation of a UK-India testbed for wireless technologies. The research is funded by the Research Councils UK (RCUK) Digital Economy Programme, led by the Engineering and Physical Sciences Research Council (EPSRC), and the Indian Government’s Department of Science and Technology (DST), with matching funding from academic and industrial partners. The research relates to core areas identified by EPSRC and DST as priorities for developing research capacity between India and the UK. The newly formed UK Coalition Government has already stated its aim to establish a new ‘enhanced relationship’ with India. One area where this special relationship will emerge very rapidly in the coming months and years is in research collaboration. The IU-ATC is now well placed to support and contribute to the aims and objectives of this ‘enhanced relationship’ from the governments as they require technical ICT solutions for improved food security, water quality management, next generation healthcare, sustainable energy-aware solutions and technologies to bridge the technological and socio-economic divide sometimes present between urban and rural populations in both countries. Ulster is the lead institution, and is one of nine research-leading UK universities and seven Research Institutes in India involved in research with the India UK Advanced Technology Centre (IU-ATC) in Next Generation Networks Systems and Services. UK partner academic institutions include University of Surrey, Queen Mary University of London, University of Southampton, St Andrews University, Lancaster University, Bristol University, University College London and Cambridge University. Within India, the academic partners include top Indian Institutes of Technology at Mumbai, Delhi, Kanpur, Hyderabad, Institute of Science in Bangalore. Of particular significance is the range and number of industrial partners involved with the initiative, including BT Research Labs InfoSys Technologies, Wipro Technologies and Tejas Networks.